Tha ceann an ear an t-Eilein Duibh am measg nan àitichean as fheàrr leam ann an Rois an Ear (gun Machair Rois fhèin a chunntadh). Nuair a bha mi glè òg ruith m’ athair ‘s mo mhàthair Taigh-Òsda an Aiseig ann am Baile a’ Bhlàir, agus nuair a bhios sinn a’ dèanamh turas beag timcheall air an Eilean Dubh an-diùgh, rud a nì sinn gu tric, ‘s àbhaist dhuinn dràibheadh seachad air an t-seann taigh, sìos do chladach Chaolas Chrombaid, agus gu ar làimh dheis seachad air Rubha Talla Neimheadh fad oirthir Bhàgh Uadal. 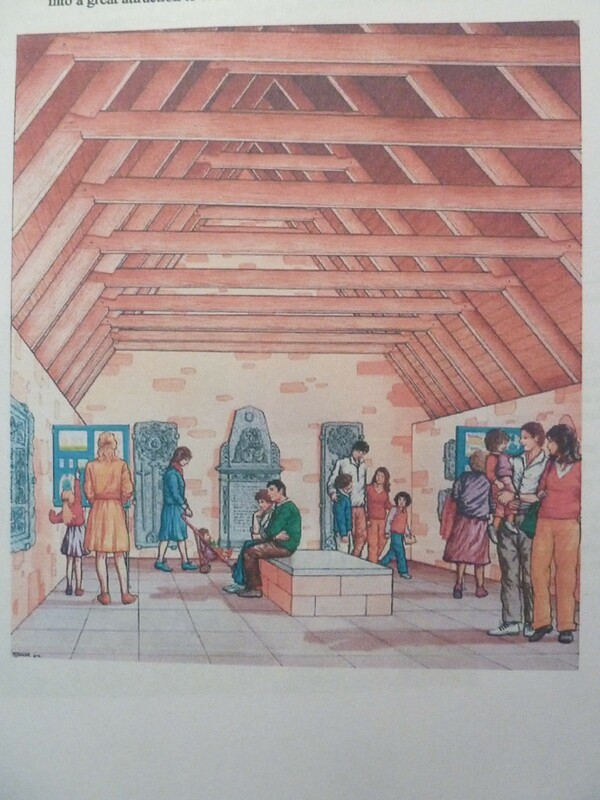 Aig ceann an rathaid bhig, chì thu tobhta a tha beag ach drùidhteach – seann Eaglais Chille Mhìcheil. ‘S e oisean sàmhach agus brèagha a th’ ann, a’ coimhead a-mach air a’ Bhàgh, craobhan agus leacan àrsaidh timcheall air a’ chaibeal, agus tha thu a’ faireachdainn na h-eachdraidh fhada a th’ aig an làrach. Chaidh an eaglais a stèidheachadh anns na Meadhan Aoisean – tha pàirtean dhith ann fhathast, aig ceann an iar na h-eaglais, agus leacan meadhan-aoiseach anns a’ chladh – agus ‘s e eaglais paraiste Chille Mhìcheil a bh’ innte gu 1662, as dèidh sinn còmhla ri Cùl a Chùdainn, gus paraiste ùr Ruigh Solais a stèidheachadh. 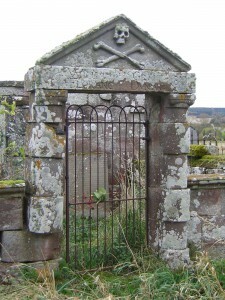 Bho 1767 dh’imrich an coitheanal dhan eaglais ùir ann an Ruigh Solais fhèin agus cha deach Cille Mhìcheil a chleachdadh ach mar àite-tiodhlachaidh no mar thrannsa-adhlacaidh, m.e. 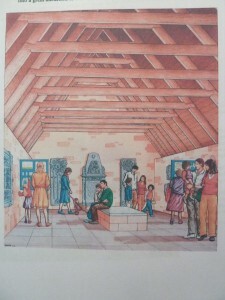 leis na teaghlaichean Seadhach-Mac Coinnich à Talla Neimheadh agus Mac an Rothaich à Ardoch (Poyntzfield). Anns na làithean seo, ge-tà, tha coltas cugallach na h-eaglais a’ chur dragh air na daoine a tha measail oirre. Tha tuill anns a’ phàirt a tha air fhàgail den mhullach agus sailthean fiodha a’ toirt taic dha na ballaichean. Ged ‘s e togalach “glèidhte” a th’ anns an eaglais, fo chùram buidhnean glèidhteachais oifigeil, chan fhaic thu gu bheil mòran ga dhèanamh gus a glèidhadh, gun ghuth air a leasachadh. Ach far a bheil ùidh agus daoine dìcheallach anns a’ choimhearsneachd, tha dòchas ann cuideachd – mar a tha fios againn fhìn ann am Machair Rois. Agus ‘s e sin a tha aig Urras Chille Mhìcheil, an ‘Kirkmichael Trust’, buidheann ionadail saor-thoilleach aig a bheil mar amas glèidheadh agus leasachadh na làraich airson na coimhearsneachd agus airson an ama ri teachd. ‘S e an t-Urras a fhuair ionmhas gus na sailthean-taic a chur a-steach, ‘s e an t-Urras a gheàrr an eidheann air falbh bho na ballaichean, ‘s e an t-Urras a bhios a’ cur air dòigh òraidean air an làrach, bileagan fiosrachaidh, agus an làrach-lìn le ‘bùth’ airson airgead a thogail – agus tha iad ag iarraidh mòran, mòran a bharrachd a ruigsinn. Chuir iad a-steach plànaichean drùidhteach airson leasachadh làn na làraich – faic na dealbhan gu h-ìosal – ach tha, mar as àbhaist, trioblaidean a thaobh airgid eadar na buidhnean oifigeil an sàs anns a’ ghnothach. A rèir coltais tha uile deònach, gu ìre, ri cuideachadh, ach ‘s math dh’fhaodte nach eil na tabhartasan a bhiodh ri am faighinn bho na buidhnean eadar-dhealaichte co-fhreagarrach ri chèile. Agus bheir iad cho fada gun tighinn gu co-dhùnaidhean …. anns an eadar-àm chan fhàs cor na h-eaglais nas fheàrr. Chan urrainn dhuinn ach a bhith dòchasach gun tig cuideachadh agus airgead mus ruith an tìde a-mach. Gur math a thèid leotha leis a phròiseacht! The east end of the Black Isle is among my favourite places in Easter Ross (apart from the Seaboard, of course). When I was very young my parents ran Balbair Ferry Inn, and nowadays, when we go on wee runs around the Black Isle, which we often do, we usually drive past the old house, down the hill to the Cromarty Firth, turn right past Newhall Point and along the shore of Udale Bay, and at the end of the lane you see the ruin, small but dramatic, of old St Michael’s Church. 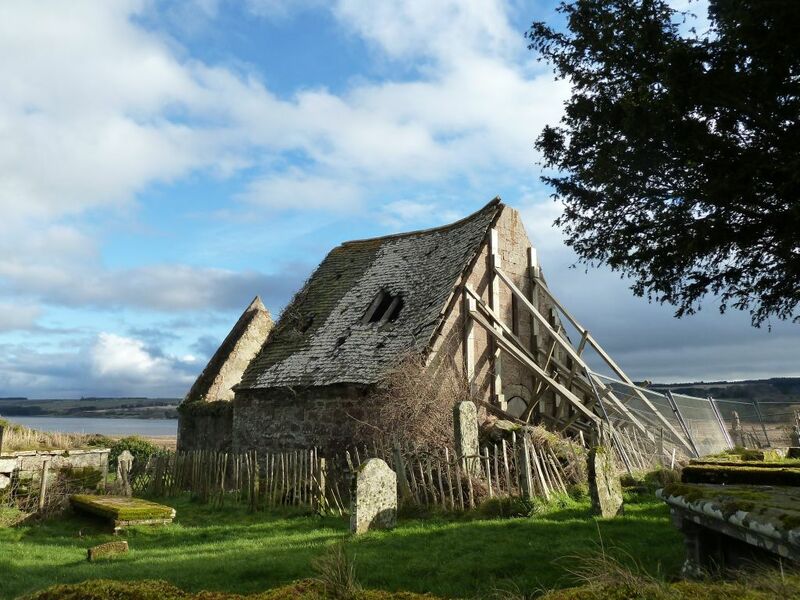 It’s a lovely peaceful corner, looking out over the Bay, with the ancient trees and gravestones around the chapel, and you can just feel the long history of the place. 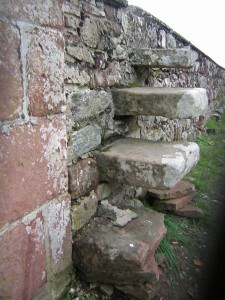 The church was founded in the Middle Ages – parts from that time are still visible at the west end of the building, and there are mediaeval gravestones in the cemetery. 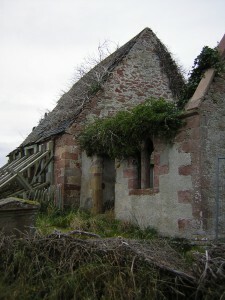 It was the parish church for the parish of Kirkmichael till 1662, later combined with Cullicudden to form the new parish of Resolis. From 1767 the congregation moved to the new church in Resolis itself and Kirkmichael was then only used as a cemetery, and the building for burial aisles for families like the Shaw-Mackenzies of Newhall and the Munros of Ardoch (Poyntzfield). Nowadays, though, the unstable appearance of the church is a worry to those who are fond of it. There are holes in what’s left of the roof and wooden joists holding up the walls. Although the building is ‘listed’, in the care of official conservation bodies, you can’t see that they’re doing very much to keep up the building, let alone develop it. But where there’s interest and industrious folk in a community, there’s always hope – as we know ourselves on the Seaboard. And that’s just what they have in the Kirkmichael Trust, a voluntary local group whose aims are to preserve and to develop the site for the community and for the future. It’s the Trust who managed to get funds to to install the supporting timbers, it’s the Trust who cut the ivy from the walls, it’s the Trust who organise talks on the site, and information leaflets, and a website with a ‘shop’ to raise money – and they want to achieve much, much more. They have submitted impressive plans for the full development of the site – see the illustration below – but there are, as usual, problems about money between the organisations involved. Apparently they are all willing, to varying degrees, to provide help, but it may turn out that the grants to be had are not compatible with each other. And they take so long to reach decisions… in the meantime the state of the church is not exactly improving. We can only hope that help and money come before time runs out. Good luck to them with their project! 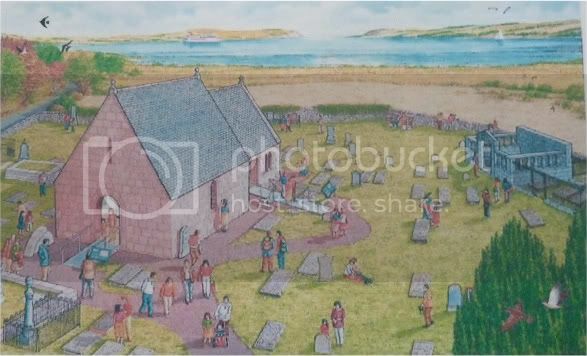 Thanks to Kirkmichael Trust for the artist’s impressions.